If you have a concrete or poly water tank, then you might be interested to know that a solution exists to keep the bottom of your water tank clean and free of sludge. What is sludge? Sludge is a mixture of sediment, bits of leaves and debris that manage to find their way into your tank and settle at the bottom. Over time, it decomposes and turns into a sludge substance. While gutter guards, leaf eaters, tank strainers, water diverters and the like all help to filter clean water into your tank, sludge build up is inevitable. This build up can cause bacteria to breed that if consumed can harm your health. It can cause vomiting, stomach upset, diarrhoea and other issues. You might be wondering what you can do to stop sludge building up in your tank. If you own a steel tank with a poly lining then things can be a bit more difficult. You will need to consult your supplier for a safe way to clean out your tank. On the other hand, if you own a poly or concrete water tank then an innovative solution exists. A company called TankVac® have created a tank cleaning system that is easy to install, powerless and will automatically clean out sludge when your tank is full. A special pipe containing many holes is installed in the centre of your tank along its floor. This special pipe is connected to another pipe that runs up along the inside wall of your tank and out through your tank’s overflow. When your rainwater tank fills up with water, an even vacuum is created across the entire base of the tank. Any debris or sludge is sucked into the pipe and then the dirty water is expelled out through the overflow at a powerful rate of up to 9 litres per second. Once the water drops to a pre-determined level in your water tank, the siphoning action automatically stops. No more worrying about gunk building up in your tank and needing to be cleaned out every several years. You can always have the highest quality rainwater on tap. 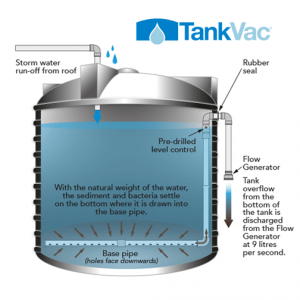 For more information about TankVac and how to keep your tank water clean, contact our friendly staff today.